Farmington senior Kaylee Woodridge competes in a sprint race earlier this season. The Knights won the team championship on Friday at the home Simpson Relays. Ste. Genevieve sophomore Megan Aubuchon competes in a 100-meter hurdles race earlier this season. She won four events Friday at the Simpson Relays. 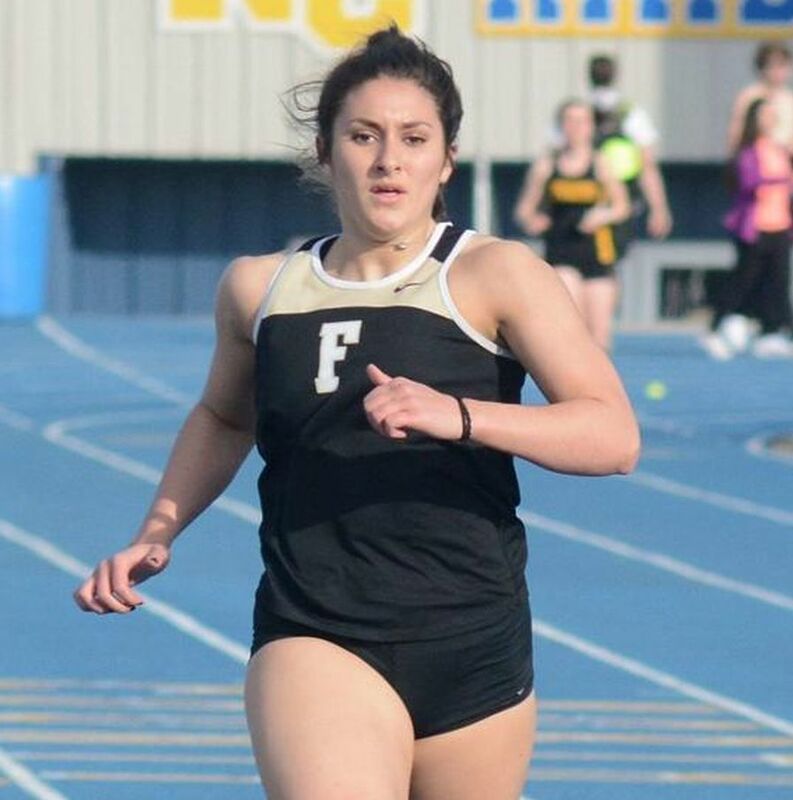 FARMINGTON – Rising freshmen Emma Gerstner and Courtney Swink provided the host Farmington girls with a crucial boost during the Simpson Relays on Friday. Gerstner shined with a team-high 34 points, including a sweep of the long and triple jumps, and Swink scored in three separate events as the Knights held off Ste. Genevieve for the title. Farmington compiled 103 1/3 points, and Ste. Genevieve finished with 85. Jefferson and North County followed in the girls’ overall standings. The Knights placed third or better in all four relay races as Kaylee Wooldridge and Jaylyn Woodley ran the bookend legs around Gerstner and Swink in the 4x100 and 4x200. Natasja Hafner won the 800, and the 4x800 quartet was runner-up. Baylee Gilliam took second in the shot put and discus throw, while Jocelyn Cunningham obtained the same result in the javelin. Sophomore Megan Aubuchon delivered a perfect score for Ste. Genevieve as a four-time champion, including individual efforts in the high jump and both hurdles events. Maci Reynolds was her closest challenger in the 300-meter hurdles, and teamed with Julia McKlin, Marysa Flieg and Aubuchon for a 4x800 victory. McKlin added second-place long jump and third-place showing behind Aubuchon in the high hurdles. Samantha Payne, who signed to play softball at MacMurray earlier in the week, highlighted the day for North County by winning the shot put and landing third in the discus. Ciarra Gross sprinted to a 200 triumph while getting second in the 400 and third in the 100 for Central. Teammate Liberty Coleman collected second in the high jump and third in pole vault. Ariahna Green was champion of the discus by a margin of exactly one inch for Fredericktown. Her mark of 104 feet, 5 inches narrowly eclipsed the top throw by Gilliam. Corinne Myers crossed third in the 3200 to headline the Farmington distance crew. Ste. Genevieve walked away with two second-place team plaques, as the boys trailed only McCluer in a meet the entailed 18 schools. Jesse Pinkley surpassed his own school record by clearing the pole vault bar at 15 feet, 1 inch. He started the meet at 13 feet after his nearest contender topped out as 12 feet, 6 inches. Pinkley also claimed second in the 300-meter hurdles – an event he earned a state medal in last spring – while teammate Evan Walker placed likewise in the shorter 110-meter race. Asa Lemons, Doug Boyer and Charles Finley formed three quarters of the Dragons’ 4x100 and 4x400 relay teams, which both finished second. The Farmington boys were fifth in the standings, getting runner-up performances from Lexie Pirtle in the shot put and the 4x800 crew of Parker Bowman, Thomas Lee, Trey Wileman and Drew Felker. Lee nabbed third position in the 3200 while Cameron Smith and Hunter Patterson did the same in the pole vault and shot put, respectively. Blaine Fingers was a three-time winner for Fredericktown in the 200, 400 and 4x200 relay events. Skyler Holland was second in the 400, and bolstered the 4x200 along with Malachi Kyle and Logan Yancey. Brayden Mullins earned runner-up honors in the 800, and javelin thrower Dawson Sutton ended up third for the Blackcats, who finished sixth among teams. Senior Ryan Grein accounted for 30 of the 56 points attained by Valle Catholic, notching his lone victory in the 100-meter hurdles. He was second in the long jump while taking third in the triple jump and 300-meter hurdles. Teammate Jackson Drury picked up third spot in the 100. Chase Nelson was third in the high jump for Central. 1. Farmington 103.33; 2. Ste. Genevieve 85; 3. Jefferson 75.33; 4. North County 69; 5. Liberty (Wentzville) 66; 6. Oakville 62; 7. McCluer 52; 8. Mehlville 47; 9. Central 46; 10. Crystal City 33; 11. Valle Catholic 26; 12. Dexter 17.33; 13. Perryville 14; 13. Windsor 14; 15. Fredericktown 13; 16. Jackson 8; 17. Greenville 6; 18. Hayti 4. 1. McCluer 96; 2. Ste. Genevieve 80; 3. Mehlville 71; 4. Liberty (Wentzville) 70; 5. Farmington 67.50; 6. Fredericktown 65; 7. Valle Catholic 56; 8. Hayti 48.50; 9. Dexter 38; 10. Windsor 37; 11. Central 27; 12. Oakville 24; 13. Jefferson 22; 14. Jackson 21; 15. North County 18.